Horizontal and vertical splitting positions. Durable and easy to use. They're made to split any logs, anywhere they're piled up. Because they're tough-as-nails log splitters, built with durable steel and cast-iron components meant to be taken deep into the woods. Horizontal and vertical splitting positions, easy to use from either side. 27- and 34-ton available. Hydraulic Cylinder Handle: Split larger logs with less lifting. 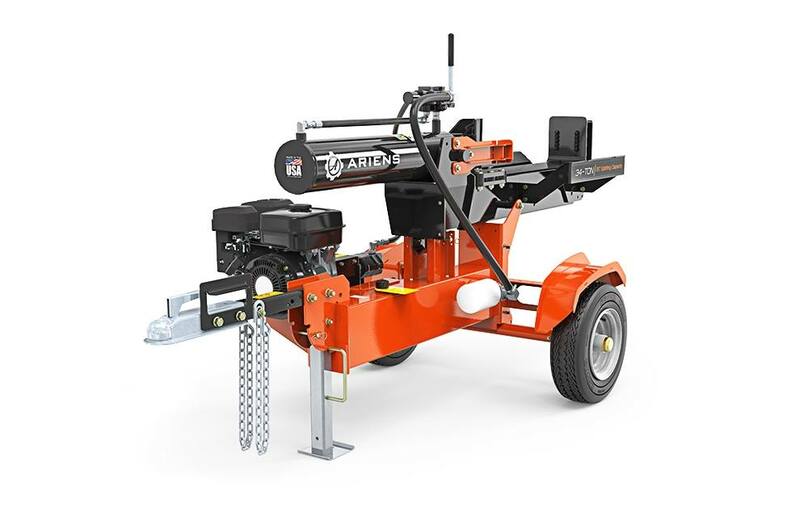 Conveniently switch between vertical and horizontal operation with your Ariens Precision Log Splitter. Muffler Guard: Protects the engine muffler against damage from wood and debris. Trailer Light Mounting Bracket: Use in combination with Ariens 71701300 Log Splitter Tail Light Kit on Ariens 22-Ton Log Splitters. Torsion Axle Kit: Ariens Log Splitter Torsion Axle Kit improves towing stability and shock absorption on all surfaces, extending the life of the log splitter. Log Splitter Cover: Keep your log splitter safe from UV damage, rain, dirt, birds, tree sap and more with an Ariens Log Splitter Cover. License Plate Holder with Light (requires 71701300): The Ariens Log Splitter License plate holder is ideal for mounting a license plate to your log splitter or adding that personalized novelty plate. The License plate holder is designed with durability in mind and includes a light for enhanced visibility. 4.8 x 4 x 8 in.